A happy dog to greet you when you come home from a long day at work. A cat purring in your lap while you’re watching your favourite tv-show. Having a furry friend in the house simply makes your life a little rosier. No wonder our insight shows about 45% of UK households now own pets – a market already worth £4.5 billion. And that number is on the rise. That’s good news if you’re in the pet care business. But there is a flip side: competition’s as fierce as a cat with new-born kittens. That means you have to pull out all the stops if you want to get noticed. Packaging can play a crucial role in driving sales. The opportunities are threefold. It’s the perfect medium to increase your visibility on shelf. It’s a canvas to show off your sustainability efforts. And it’s a way to pleasantly surprise and connect with e-shoppers. Did you know that your product has merely two-seconds to capture shoppers’ attention in-store? Therefore, it’s all about making your presence known instantly. And since your shelf ready packaging (SRP) is the first point of interaction for shoppers in-store, it provides the perfect platform for your brand to communicate its story and key information. Sustainability is gaining importance, with over a quarter (27%) of British pet owners claiming recyclable packaging to be most important to them. Millennials, one of your biggest audiences, who are most likely to own pets, align purchasing decisions with their own political and social values. That’s why instead of following what the majority is doing, you need to get ahead of the pack. If you’re positioning your brand as ethically-sourced, that’s a great start. Making sure your packaging reflects it, is better. With both the pet sector and e-commerce on the rise, it’s no wonder about 8.3% (and counting) of cat and dog food is purchased online. It’s at that point your packaging gains even more importance: it becomes the only physical point of contact between your brand and your customer. Needless to say, that’s your moment to stand out. So: make sure to get your basics right, first. Then start thinking about ways to further enhance the overall unboxing experience. Printing inside the box, increased connectivity through augmented reality, … are sure to elicit ‘wows’ from your audience. In conclusion: our research shows that packaging in all its forms – be it on shelf or online – is an untapped marketing opportunity for the pet sector. The synergies between primary packs and other formats enable brands to attract shoppers in a crowded marketplace and tell an engaging brand story, while ensuring the quality and safety of products. If you’re not sure how to get started, a packaging strategist at DS Smith can help you develop the right approach. 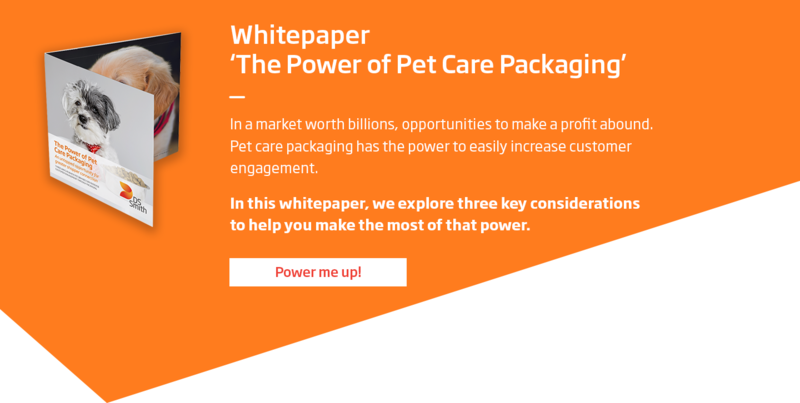 Get in touch or if you’d like to read more on all the different ways to grab your customers’ attention, download our whitepaper ‘The Power of Pet Care Packaging’. *Editors Notes All figures, unless otherwise stated, are from YouGov Plc. Total sample size was 4515 adults of which 2317 were pet owners. Fieldwork was undertaken between 21st - 25th June 2018. The survey was carried out online. The figures have been weighted and are representative of all GB adults (aged 18+).